LANGHAM, Sask. — While men in tractors pulled seeding and tillage implements over the ground at the July 17-19 Ag in Motion show, the DOT autonomous seeder laboured quietly on its own. Its U-shaped chassis and diesel power source is designed to connect with other compatible implements, and in fact several have been developed. 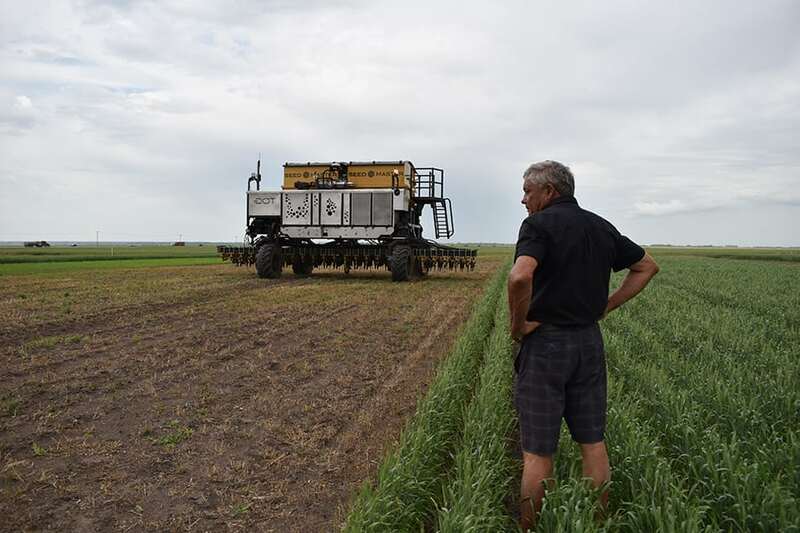 Norbert Beaujot, president of Seedmaster and inventor of the DOT technology, said July 18 that autonomous farm equipment is the way of the future and farmers are already becoming more comfortable with both the idea and its use. “I think if you take a survey of the average farmer, yes, they’re skeptical, but the farmers that we’re selling to are the leading, larger farmers and they’re not skeptical,” he said. In a speech at AIM, Beaujot talked about innovation, growth and excellence in agriculture. Innovation is something of a byword for the farmer and inventor, who has more than 50 patents in his name, most if not all of them related to farm equipment. “I’m passionate about making things better but also simpler,” he said in his talk. One of nine children, Beaujot earned a degree in agricultural engineering at the University of Saskatchewan in 1970. By the 1990s, he had undertaken his quest to devise better and more accurate seeding equipment. He followed that with the establishment of Seedmaster and the invention of the SmartHitch, a method of seeding between stubble rows. Many other innovations followed, but the autonomous DOT, which shares its name with Beaujot’s mother, is among the latest. He acknowledged that farmers are initially wary of driverless farm equipment, but the technology is the same as that used in driverless cars, which have also made a relatively recent debut. “It’s the direction we’re going,” he said in an interview. “The technology is all technology that’s been used for years. Farmers are just not used to seeing it the way that we’ve put it all together. A survey undertaken in 2017 by Glacier FarmMedia indicated that about 75 percent of farmers said they wouldn’t be ready for autonomous vehicles for three to five years. They cited loss of the human element, complexity and expense among the primary reasons. On the plus side, survey respondents liked the idea of saving time and lowering operating costs. Beaujot said safety was an oft-stated concern when DOT debuted, but safeguards built into the units are designed with that in mind. Software is designed to shut down the DOT if it deviates from its designated path, and a trip wire that hangs in front of the machine will also shut it down if it touches anything it shouldn’t. Beaujot said DOT can help address the chronic agricultural labour shortage. That’s why farm equipment has become steadily larger, but accuracy and maneuverability have been sacrificed. “I was uncomfortable with the way we were going because we were getting less and less efficient because of the bigness of the equipment,” he said.